Businesses and organizations are creating and using data at unprecedented rates. With this boom in big data comes challenges and problems in information and data protection. Previously, enterprises emphasized perimeter security over things like endpoint protection, data-centric security and data loss prevention. Now, the rise of mobility and ever-expanding security perimeters make it necessary for companies to find data protection solutions that secure data from both internal and external threats, placing the focus on sensitive data as it travels within and outside of enterprise networks. The ever-changing landscape of data protection has resulted in a tremendous amount of knowledge sharing and thought leadership from technology experts, industry analysts, consulting firms, privacy lawyers, and others with a vested interest in data security and protection. These experts share their knowledge and advice in a wide range of formats, including blogs, white papers, videos, webinars, guides, and other online resources. With the sheer quantity of information and resources available online today, it can be difficult to sort through it all to find the most trusted and experienced sources that provide accurate insights and educated perspectives on relevant data protection challenges facing modern enterprises. So, we've compiled a list of 51 useful data protection resources to help you secure your data and feel more at ease about your company's valuable information. Our list includes reports from leading industry analysts, surveys, data protection blogs, white papers, videos, and more. The following 51 resources aren't listed in any particular order, other than by category. This list is not intended to imply that the resources included here are the best or only resources on the topic; rather, these are 51 data protection resources we think are worth a look, from analyst reports worth reading (or re-reading) to resource portals worth adding to your bookmarks. If there's something great that's not on the list, let us know in the comments! The Information Commissioner's Office (ICO) upholds information rights that are in the public interest and promotes openness by public bodies but strives for individuals" data privacy. The ICO Blog focuses on those information rights issues, and especially data protection. The blog of Hogan Lovells, privacy attorneys and data security lawyers, Chronicle of Data Protection includes posts about consumer and financial privacy, cybersecurity and data breaches, and other topics of relevance to data protection. With the latest information on security news and trends, Chronicle of Data Protection is a useful read for those who need the most up-to-date data protection regulations and news. datonomy boasts a team of home, international, and guest bloggers to make it a well-researched data protection blog. Posts typically discuss data protection law and practice, as well as the problems and challenges associated with data protection. Draft EU proposals on cyber and data breach notification: where are we now? The Data Protection Technology Blog is provided by the Guardian, which covers American and international news for its global online audience. Data Protection Technology Blog is frequently updated with the latest news and information about worldwide data protection issues and is a trustworthy resource. Privacy Matters is written and maintained by DLA Piper's Data Protection and Privacy practice. Posts update readers about legal matters and regulations regarding data protection, plus include analysis of data protection happenings around the world. The expert behind the IT Security Expert Blog is Dave Whitelegg, a UK-based information security expert. Whitelegg makes his blog accessible to people at all levels of technology knowledge and provides his views on IT security, privacy, and data protection. You're so hacked, you don't even know it! As the Privacy Surgeon, Simon Davies provides "forensic insights from the world's most experienced privacy advocate." Davies analyzes issues of privacy, information security, and data protection in his informative, sometimes satirical posts. Has Europe played its dirtiest hand ever to undermine data protection reform? Martin Hoskins is the Data Protector, and he uses his blog "to offer an irreverent approach to data protection issues." Hoskins' preference for transparency, fairness, practicality, and risk-assessment over technical principles are clear in his data protection posts. Privacy regulators resolve to try more joined-up enforcement - but why? What's the difference between data protection and privacy? BakerHostetler is "one of the nation"s largest and most comprehensive practices in the area of data privacy and information security." Data Privacy Monitor, their blog, offers information on data privacy and information security and is a very helpful resource to organizations that handle data protection. Will Using "Apple Pay" Keep the Data Breach Away? Data Protection Insights, a blog provided by Computerworld, shares the advice and insights from Peter Eicher"s more than 15 years of experience in the computer software industry. The posts cover data protection-related topics such as data backup and recovery and storage, among others. Are there data squirrels in your IT department? Makin" copies! How many copies of data are you storing? Data protection and growth within budget. Possible? Produced by Dentons" Global Privacy and Security group, Privacy and Data Security Law provides information on creating, collecting, using, destructing, and securing data for compliance, to minimize litigation risk, and to maintain usability. The blog posts provide very detailed information and advice for data protection and other related topics. Progress on EU data privacy reform: "irreversible"
Innovation Insights, a community blog and forum, is "dedicated to new thinking for a new era in technology." Community members post their thoughts, ideas, insights, and tips on everything from big data to supercomputers on the blog, but there is a rich discussion centered on data protection that is definitely worth a read. Data Protection from CSO provides readers with the latest news, analysis, opinion, and more regarding data protection. With research and how-to guides, Data Protection is a robust blog that serves everyone who is tasked with data protection. Infosecurity Magazine"s Data Protection category includes information on best practices for managing data breaches, information risk management, and tools and procedures for effective data loss prevention. Information is presented in a variety of formats, including white papers, webinars, and articles. TechTarget"s Enterprise Data Security and Privacy section is a robust collection of perspectives, news, and insights on data protection. You"ll find news stories and vendor resources, product reviews, Q&A resources, and more. The White House got hacked; are you next? The System Center: Data Protection Manager blog at TechNet covers all things related to Microsoft System Center products, in addition to general news and industry insights on data protection, security, and mobility. ESG Global offers a robust collection of resources, analyst reports, surveys, and other insights related to data protection. Blogs, videos, and lab reports offer insights on the latest research in the field of data protection, as well as varied perspectives from industry analysts and thought leaders. Why Doesn't IT Back Up BYOD?! 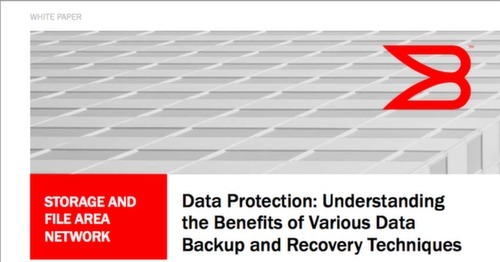 The Brocade white paper "Data Protection: Understanding the Benefits of Various Data Backup and Recovery Techniques" features content about how organizations should define their recovery objectives. The paper also discusses how organizations should align their technology strategy and business requirements and is a valuable read for any company executive who makes decisions about data protection. 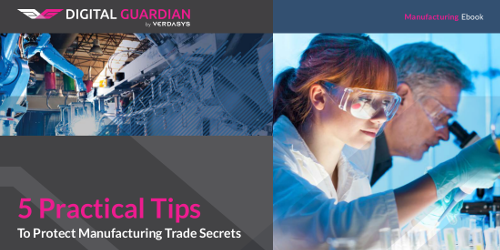 Digital Guardian's 5 Practical Tips to Protect Manufacturing Trade Secrets offers five key recommendations for evaluating your organization"s security program"s ability to protect your IP from cyber espionage attacks. Known for its technology insights, market intelligence, and advisory services, ISG is a leader in the field. ISG"s white paper, "Defining the Right Data Protection Strategy: The Nuances of Backup and Recovery Solutions," is an authoritative data protection resource from ISG"s Cindy LaChapelle, Principal Consultant. Insider threats pose substantial risks to enterprise intellectual property. Dan Geer reveals strategies for mitigating the risk of insider threats in this white paper from Digital Guardian. This study, conducted by the Ponemon Institute, uncovers what executives consider to be the most important considerations in the safeguarding of sensitive information and the compliance with increasing regulatory requirements. This is the second such study focused on the awareness of CEOs and other executives about their companies" data protection efforts and the value in data protection initiatives, both in terms of economic justification and in how well these efforts support broader organizational goals. Expanding mobility programs have created less-definable security perimeters for enterprises. That"s the focus of this analysis from the Ponemon Institute, which surveys 676 IT and IT security practitioners with knowledge of and/or involvement in endpoint security. The study finds that endpoint security is more difficult to manage than ever. This Executive Summary from the Verizon 2014 Data Breach Investigations Report reveals findings from an analysis of data from more than 50 organizations around the world and more than 63,000 security incidents. In total, 1,367 confirmed data breaches were studied, identifying nine key patterns that have contributed to more than 92 percent of data breaches within the past decade. Unstructured data is one of the most substantial risks to enterprise security in the modern landscape. This white paper from Digital Guardian discusses how new approaches to security provide the most effective and proactive protection for unstructured data. Most enterprises and SMBs are aware of the potential cost of unrecoverable data on lost or stolen laptops and mobile devices, even desktops. But while mobility continues to gain momentum, most firms fail to implement adequate security measures that sufficiently address the increased risk. This IDC analyst report, available from InformationWeek, discusses why adequate endpoint protection is more critical than ever. Knowing what happens when data is used or combined in a particular way is the next step in security. That"s the focus of this analyst report, offered by TITUS, providing an understanding of the shifting security requirements for data as it changes state or location throughout an enterprise. In the modern security landscape, the perimeter approach is no longer sufficient given the constantly shifting security perimeters of most enterprises today. A data-centric approach to security ensures that security measures travel with your data throughout the enterprise network. This analyst report from Forrester, available through Digital Guardian, discusses the advantages of the data-centric approach over more traditional perimeter-focused methodology. While endpoint protection has historically been an afterthought as mainstream backup and recovery vendors emphasize servers, endpoint data protection is now beginning to become more of a focal point for both IT security and backup/recovery services. This analyst report, available from Code42, discusses the driving forces behind this shift and the role of endpoint protection in modern security. Consumers continue to be at risk of identity theft, despite the Payment Card Industry"s (PCI) Data Security Standard (DSS). The results of this PCI DSS Compliance Survey reveal the findings of a survey across more than 500 U.S. and multinational IT security practitioners, presented by Imperva and the Ponemon Institute. Security too often focuses on systems and devices, largely ignoring data. This analyst report from TITUS reveals why data should be the focus of security and how analyzing, identifying, and defining data are the keys to effective enterprise security. This Final Sponsor Report from ESG Research, offered via CIOSummits.com, covers the modernization of data protection based on an in-depth survey of 330 IT professionals responsible for data protection solutions encompassing hardware and/or software. Mid-market and enterprise-class organizations from both North America and Europe are represented in this survey. IT BusinessEdge"s slide show, "Eight Steps to Enterprise Data Protection," explains eight steps for developing an enterprise data security plan. IT BusinessEdge reminds companies that they no longer can focus solely on perimeter security for their data protection, because more than 50 percent of security breaches are committed internally. 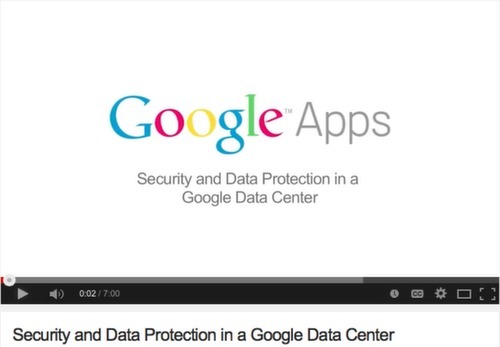 This video features a tour of a Google data center. The security and data protections that are in place at Google"s data centers are highlighted in the seven-minute video and serve as a model for other organizations looking for data protection solutions. 35. Data Protection in the cloud are we fooling ourselves? 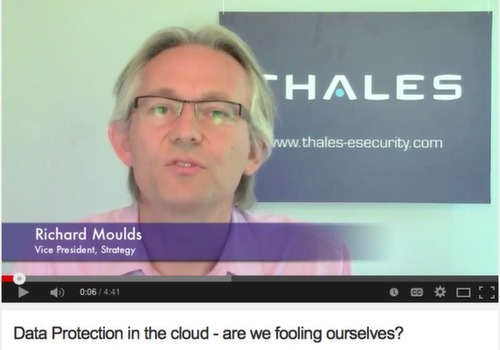 In this video from Thales e-Security, Richard Moulds, Vice President of Strategy, explores several questions surrounding data protection and the cloud. He details information from a study that shows how organizations should approach data protection in a cloud environment. Three key topics we like from Data Protection in the cloud are we fooling ourselves? This nearly hour-long webinar includes presenters Ken Rashbaum, attorney and principal of Rashbaum Associates, LLC, and Dr. Johannes C. Scholtes, chairman and chief strategy officer of ZyLAB. Moderated by Mary Mack, enterprise strategy counsel for ZyLAB, the webinar explores the need for enterprises to find practical solutions for reducing the risk and cost associated with data protection challenges. This video by Jason Buffington, whose specialty is data protection and Windows Server infrastructure, management, and virtualization, explores the idea that data protection is an umbrella term. The video explains how data protection actually is a broad range of IT behaviors, including archiving, backups, snapshots, replication, high availability, disaster recovery, and business continuity. This ESG Research Spotlight video, commissioned by Zerto, features ESG senior analyst Mark Bowker. In Data Protection Challenges of Virtualization and the Cloud, Bowker discusses the challenges IT organizations face as they virtualize their environment. Womble Carlyle attorney Ted Claypoole and former White House CIO Teresa Payton co-authored the book "Privacy in the Age of Big Data." This video series on YouTube is a collection of discussions between the authors about the data protection topics and issues they cover in their book. The Nimble Storage company offers flash storage solutions. Their infographic analyzes survey results from 1,600 small, medium, and large businesses worldwide in regards to the need for aggressive data protection. A leader in software that processes unstructured data, HP Autonomy is known for its enterprise backup and recovery capabilities. The Rethinking Protection for the Modern Data Center infographic captures modern approaches to data protection. DLA Piper is a global law firm with more than 4,200 lawyers working to help companies with their legal needs. Their interactive handbook, Data Protection Laws of the World, is geared toward businesses and organizations looking for help in comparing data security and data protection legal matters around the world. SNIA works to advance IT technologies, standards, and education programs for IT professionals. Their Data Protection and Management Tutorials are available for download directly from their site, and visitors also may view abstracts prior to downloading so they can decide which tutorials are best suited to their data protection needs. The Data Protection Act of 1998 includes a number of legal obligations for companies to follow in order to protect information. The Guide to data protection from ICO is intended for organizations that handle personal information about individuals and are concerned with complying in all areas of data protection. The EU Data Protection Regulation guide from ComputerWeekly.com explains the new European Data Protection Regulation in full. This essential guide also helps businesses to determine whether they need to make any changes in their data protection solutions to meet those regulations. The International Association for Information and Data Quality (IAIDQ) is "a not-for-profit, vendor-neutral professional society of people who are interested in promoting and defining information and data quality." The Information Quality Journal is the association"s publication that shares insights for data professionals, including those pertaining to data protection. Some articles are free to read, while others are available only to members. InfoSec Institute provides high-quality information security training. Their articles and technical tutorials focus on data protection-related issues, including layered protection, data protection tools, sharing sensitive business data, and more. The TH!NK PRIVACY toolkit, a set of training materials from ICO, was "created to aid the communication of the challenge faced by organisations of all sizes, to their employees reminding staff to "press the mental pause button" before taking action." With free downloadable posters, bin stickers, and postcards, TH!NK PRIVACY provides the materials helpful for reminding employees to think about data protection during all stages of their work. The International Association for Information and Data Quality (IAIDQ) provides dozens of publications for both members and nonmembers. The publications cover a wide expanse of years and include webinars, journal articles, book reviews, industry reports, and other information sources on data protection. Hunton & Williams" privacy practice is a worldwide firm with experience and knowledge in information security and data protection. Their lengthy list of publications is a valuable resource for IT professionals and company executives who bear the responsibility of data protection. The Online Trust Alliance creates the 2014 Data Protection & Breach Readiness Guide to help organizations of all sizes understand the issues and solutions that can enhance data protection practices and develop readiness plans to enable rapid incident response. Data classification when done right can provide actionable risk intelligence and deliver significant business value. Learn more in our whitepaper.